Even academics relish the thrill of the kill. Auburn University forestry researcher Mark J. Hainds, whose published work includes “Distribution of Native Legumes in Frequently Burned Longleaf Pine-Wiregrass Ecosystems” in the American Journal of Botany, is an authority on vegetative habitats, in particular, the longleaf pine. 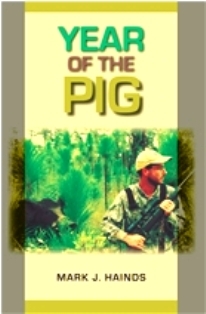 He’s also quite familiar with feral pigs and the damage they inflict on agricultural fields and other ecosystems, which is thoroughly documented in his book Year of the Pig. Hainds is a responsible hunter who enjoys stalking, shooting, eating, and eradicating a menace known as the wild hog. There’s been a shocking proliferation of wild boars in America. (Since 1982, their numbers have flourished from twenty states—mostly in Texas and Florida—to now include forty-four states and Canada.) Hainds’ goal was to kill feral pigs in ten states in 2007, the Year of the Pig in the Chinese calendar. He even took his family to Hawaii hunting Polynesian pigs “Hawaiian-Style,” which the author describes with gusto: . . . using dogs to bring the hog to bay. Once the pig is bayed, it is killed with a knife stab to the heart. YouTube has several clips of this type of hunting, and it looked pretty exciting. It also involves another hunter holding the 100-plus-pound pig by the hind legs so that the fatal stab can be inflicted. The author shares a bit of history. Hernando de Soto introduced pigs to North America so that populations of swine might be sources of meat for further trips back to the newly discovered land. Their reproductive rates and keen ability to survive and thrive make feral pigs Public Enemy Number One in the pest control world. They destroy crops as they root for food and proliferate diseases to domestic pigs. Hainds makes an excellent case for the need to stop them.